I was tagged by Nicole sometime ago to do a blog post about 10 of my Favorite things. So here goes, not in any order! 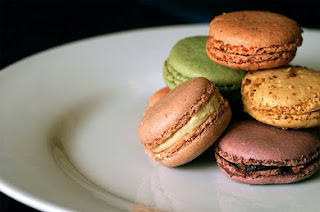 Macaroons - I simply LOVE LOVE them. So light & tasty treats. The really good ones are quite expensive in Singapore. Nevertheless, I can never control myself to get some every time I walk pass a Macaroons / Pastry shop. My favorite flavor is Hazelnuts! Souffle - This is another French dessert that I simply must have if it is ever on the menu. I recall visiting a restaurant in Paris which specializes in Souffles. They have the savory ones which we do not get in Singapore. God - HE is my everything and without him, nothing around me would matter and anything is possible with Him by my side. My Hubby & Family - He is my life partner and best friend. He makes me laugh & giggle like a little girl. We share everything (almost) and I thank #4 for making him mine. Family (mum, dad, in laws, siblings) is always something close to my heart. 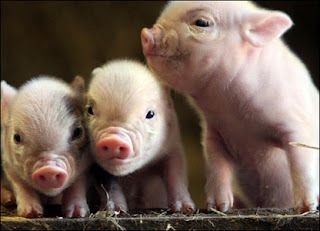 Pigs - Love them since I was little. I think they are just adorable whether they are babies or adults. Thus my shop name I guess. Music - I am always humming a tune, whether I am walking along the street or having a shower. I love music of all genres but rock, alternative, punk, jazz, house & chill are some of my favorite. My bed - The place that I spend at least 7 hours in. Got a nice king size one that is simply divine. Not sure how many of mine are also your favorites.. but do share yours. mmmm... macaroons and souffle... yum! maybe you can eat them in bed? Definitely love SATC ~ I want to own the series one day. I love your top ten list..God is my #1 also!! !